I think you could say I am a little bit of a Sneaker Head. Every time I go shopping I will end up in the nearest JD Sports or Footasylum to see if I can get anything new. We currently have a 6 tier shoe rack that I have basically filled and poor Liam barely has any space left for his shoes which to be honest isn't that much of a problem as he doesn't really buy a lot, he has his favourite pairs and that is it. So here is what I currently have in my collection, but I am hoping to add to this soon. I only own 3 pairs of Adidas, this grey pair I have owned for a while now and to be honest they only ever really come out in the warmer weather as they look quite nice with my denim shorts. These Sambas my dad actually gave me because he got totally the wrong size, they have been well loved and to be honest they are close to being thrown out but I can't bring myself to do it as they are such a comfy trainer. Next up is my workout shoes. I will only ever wear Nike for the gym and this nearly always stood with my football boots too. 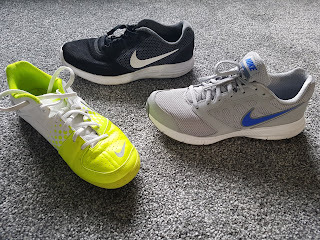 I got these yellow Nike ones back when I started collection believe it or not in 2011 and they are still standing, they are perfect for the kickabouts in the garden. These black ones I have had for a while now but they are still so comfortable so I do still wear these. For some reason I like my outfits at least a little colour coordinated whilst I work out. This grey pair I got for Christmas from my Mum and Dad, I have just got back into the gym and these have been absolutely perfect so far. 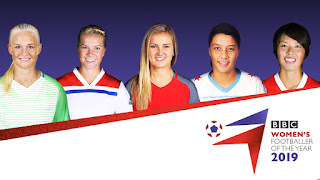 Nike has always been my go to brand, they just have so many great design and they are bringing so many great ones out each year if I could I would spend all my wage on Nike each month. My Air Force 1 hi-tops are my go to pair and honestly they are a little worse for wear. I need to chuck these out and get a new pair. My red blazers were a present for my 17th if I remember correctly, they are in surprisingly good condition so I need to get wearing these a little more. The white air-max, were also a gift from my parents. They got me and Georgia the exact same pair so we have had to careful work not to be wearing matching as obviously being sister we didn't want to be seen in the same thing. This grey and red pair I got just before Christmas and they have become my work shoes, I need something comfy to wear during the day and for my walk too and from work, these tick all the right boxes. The Nike SB's are also from around Christmas time and were a total bargain at the Nike outlet, they are really comfy and go great with my shorts in the warmer weather and also my skinny jeans. 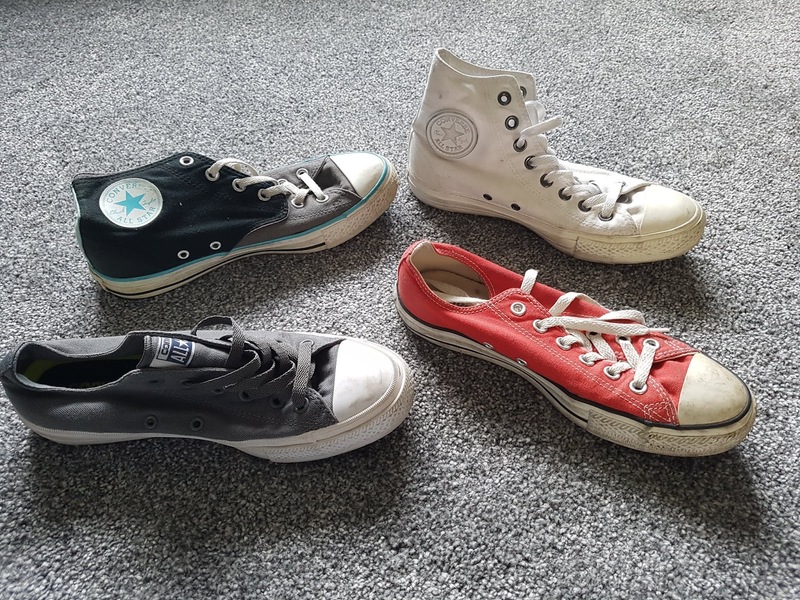 Converse is another brand I seem to wear quite a bit. 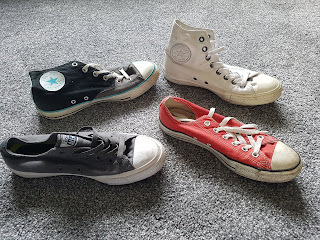 These multi tone converse hi-tops have been on my shoe rack for ages they are a pair I just can't get rid of as they are so easy to style. The white converse really need to be cleaned but they are brilliant no matter what weather, I think I will be re buying these in the future. The grey ones were a pair I picked up for a holiday to wear with my shorts on nights out and they didn't let me down they were perfect. The red converse is one that other people in the family really weren't keen on but I got these when I got my Nike Blazers for my birthday. They have been well loved and look a bit of a mess but I think that makes them look a little better. I won't go into my new Miley Cyrus converse as you can read all about them here. 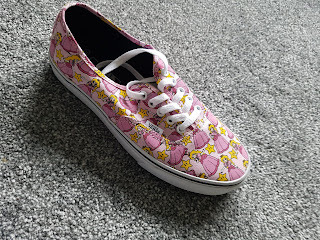 Vans are something I buy the odd pair of but never really get too many of. 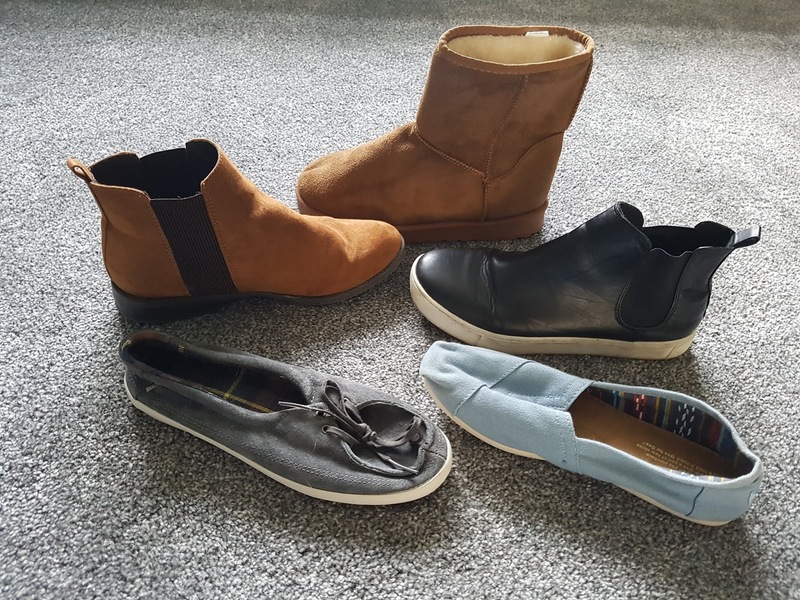 The black leather ones were a Christmas present and are actually the comfiest pair I own, the other 2 pairs I will wear in the nicer weather but I don't wear them too often. I am a gamer and always will be so when I saw Vans doing their Nintendo collaboration I knew I had to pick up a pair so I got these Princess Peach ones. Liam laughs at the fact I don't wear them and just want to keep them nice and clean, but can you blame me? Look how cute they look. 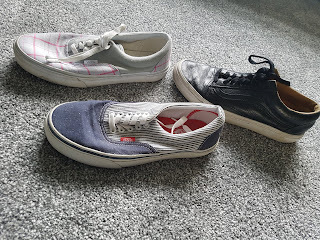 My Puma Suedes are one of my favourite shoes which you can read about here. But I really do need to start wearing them a lot more as they are currently just sat on the shoe rack. Moving away from trainers for a bit, this is how little of a choice I have if I am going out and don't want to wear trainers, vans or converse. These Primark version of Ugg boots are super comfy but I really don't get enough wear out of them when I should start to wear them a lot more. These black and white boots were only £3 from H&M and I got these as they are something like Tegan and Sara would have worn in the Love You To Death era. They are actually really comfy and super easy to clean and they are easy just to throw on. The Toms were bought from Costco of all places for a holiday we was going on and I have found them perfect to dress up my shorts a little. Similarly to the Toms my Vans boat shoes were also for a holiday but I have found these work great with my chinos. I wore my last Chelsea Boots to death and I realised I didn't have any smart looking shoes so I ran out and got these from Primark. They were only £8 and honestly you would have thought that they would have cost a lot more with the quality of them. Finally I have saved the best until last. These white Fila trainers are a recent buy that I am yet to wear but I already can't wait to style them. 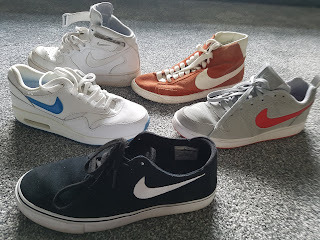 I wanting a nice white trainer for a while and managed to pick these up pretty cheap from Schuh. I absolutely love Jordan's and really want to buy more but for now I just have this one pair, I was worried they wouldn't suit me but styled with skinny jeans or skinny tracksuit bottoms they actually do look good. Johan Cryuff is an absolute legend in my eyes, I had a Cryuff hoody and had to get the trainers for someone who I looked up to growing up. These have lasted me absolutely ages and still look great. I actually got these to wear for my 21st birthday party and got a lot of compliments about them on the night. 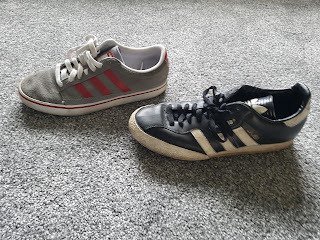 Finally are my current favourites, I really don't want to ruin these at £80 they were definitely an investment but I absolutely love these Adidas Derupts, they are so light you forget you are wearing them and the colours are amazing. Make sure you have keep checking back on the blog as I will be posting a lot more fashion related posts in the future so some of these shoes will be featured. 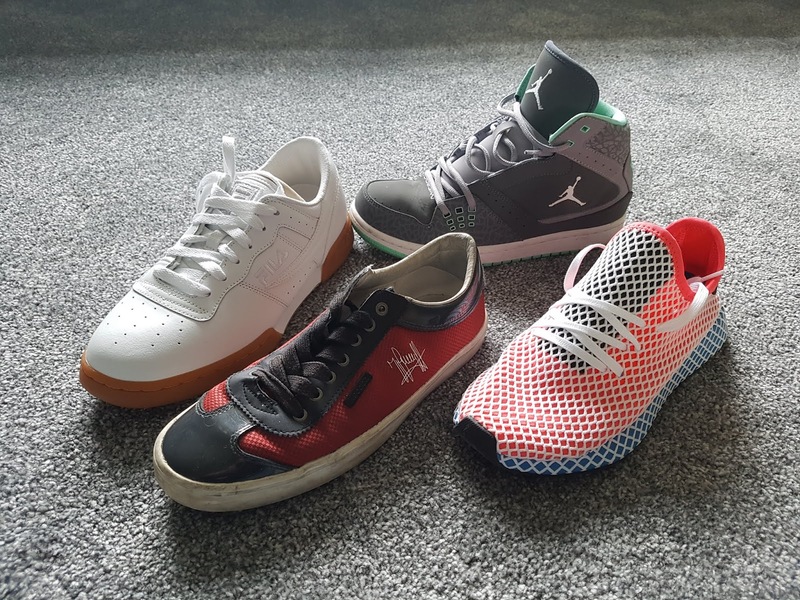 Cool selection of trainers. 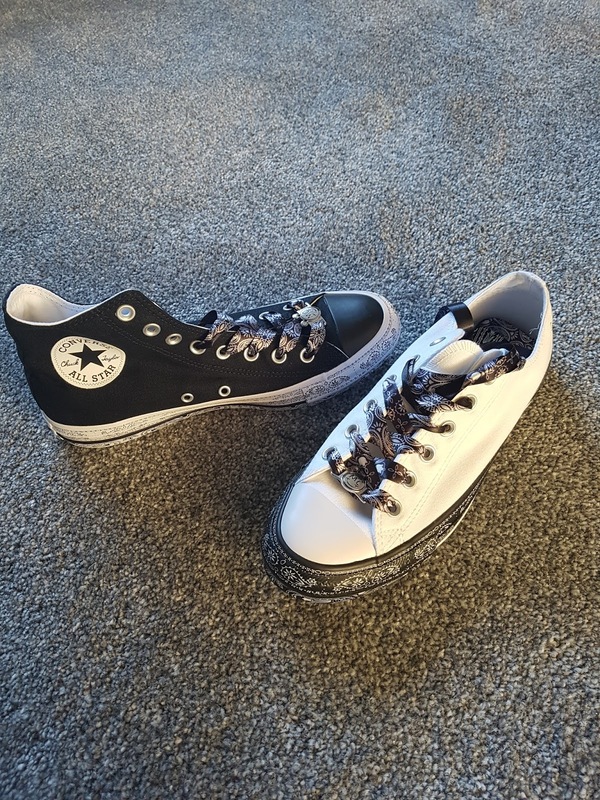 Cant beat a pair of chucks. Have you tried superga? they make some nice trainers too.